^ 1.0 1.1 Turkey 'shoots down Russian warplane on Syria border'. BBC. 2015-11-24. 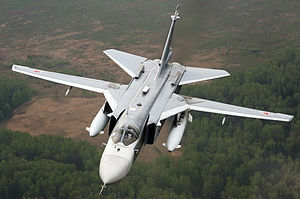 ^ "What Is A Fencer Su-24? What To Know About The Russian Plane Shot Down By Turkey". ibtimes. ^ Missing Russian jet pilot 'alive and well' in Syria. BBC. 2015-11-25. ^ "Turkey downs Russian jet". AJE Live. ^ 5.0 5.1 土耳其派F-16击落俄罗斯战机. 新京报. 2015年11月25日 [2015-11-25]. ^ "A NATO Country Just Shot Down a Russian Warplane for the First Time Since the Cold War". Maxim. ^ Syria-Turkey tension: Assad 'regrets' F-4 jet's downing. BBC. 2013-07-03. ^ Turkish jet downs Syrian warplane near border. The Big Story. [2015-03-04]. ^ Harro Ranter. ASN Aircraft accident 16-MAY-2015 Mohajer-4. [2015-05-29]. ^ F-16'ların vurduğu İHA, İran yapımı 'Muhacir'. 2015-05-18 [2015-05-29]. ^ Battle for Iraq and Syria in maps. BBC. 2015-11-17. ^ Syria conflict: Turkish jets intercept Russian plane. BBC. 2015-10-05. ^ Syria conflict: Turkey summons Russian ambassador a second time. BBC. 2015-10-06. 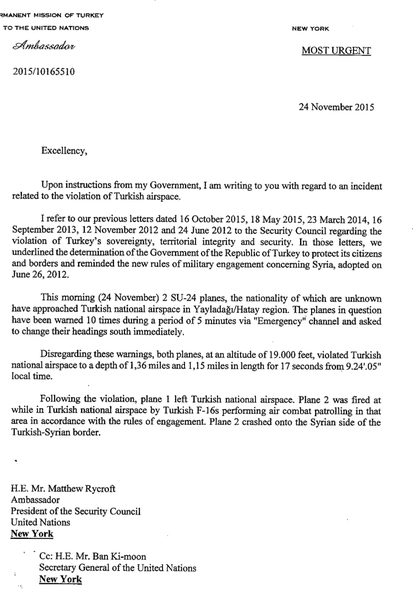 ^ Turkey's statement to the United Nations Security Council. Al Jazeera. [2015-11-24] （澳大利亚英语）. ^ H.E. Mr. Matthew Ryeroft. Permanent Mission of Turkey to the United Nations, Ambassador 2015/10165510. UN. 2015-11-24. Disregarding these warning, both aircraft, at an altitude of 19.000 feet [5,800 m], violated Turkish national airspace to a depth of 1,36 miles [2.52 km] and 1,15 miles [2.13 km] in length for 17 seconds from 9.24'.05'' local time. ^ Turkey shoots down Russian jet near Syrian border. Business Standard. 2015-11-24 [2015-11-25]. ^ Минобороны РФ: российский Су-24 сбили при возвращении на авиабазу в Сирии: "Российский военный самолет Су-24 при возвращении на авиабазу Хмеймим был сбит турецким истребителем F-16 на территории Сирийской Арабской Республики", - сказали в военном ведомстве [Defense Ministry: Russian Su-24 shot down while returning to base in Syria: "A Russian military aircraft Su-24 when returning to the airbase Hmeymim was shot down by Turkish F-16 fighters over the territory of the Syrian Arab Republic," - said the Defense Ministry]. 塔斯社. 2015-11-24 [2015-11-24] （俄语）. ^ 俄遭击落战机获救飞行员接受采访 称“我很好”. 中新網. 2015-11-25. ^ Turkey releases audio of 'warning' to downed Russia jet. BBC. 2015-11-26. ^ Turkey gave no warning' - downed Russian pilot. BBC. 2015-11-25. ^ 俄总理：土耳其庇护IS 与其存在石油利益关系. 中新網. 2015-11-25. ^ 普京签署制裁土耳其总统令 明年土公民暂不得入俄境. 中国新闻网. 2015-11-29. ^ 端傳媒. 戰機都被擊落了 俄羅斯這次為什麼忍了？. [2017-03-16].